In an earlier post I mentioned that one of the missionaries wanted to make a bench press out of an old bed frame. Here Elder Perkins shows how he uses the finished bench press to lift some home made weights. The Elders like to build up their arms so that the sleeves of their shirts become tight. We took a picture of another more sophisticated bench press we saw in another apartment. and "God's Place" chicken and rice in Teshie. We better stop eating in these dives before we get sick! We went to the Kpong district conference the weekend of April 8 and stayed over night in the Royal Senchi Resort which is a very nice hotel along the Volta River with well planned guest rooms and even some peacocks (with chicks) running around the grounds. The Kpong conference was well attended and we sat outside under a canopy. It was extremely hot and I found relief by using my water bottle to poor water down my shirt collar - the trickle down effect was great! I have inserted one of the hymns the choir sang - they do have good choirs here! You need to use a laptop to view this video. During the month we said good-bye to some more missionaries which included two cousins from Tonga who were anxious to return to spear fishing and island life style. We also said good-bye to the Bakers who served as humanitarian missionaries. They looked after getting fresh water wells drilled in small villages that use surface water that can cause sickness and sometimes has to be carried a long distance from the source to the village. Elder and Sister Steven Webster also returned to their home in Australia. Their friendly ways and ability to organize social events will be missed. On Tuesday's we often attend a District meeting such as the one we went to in Adenta which is held in one of the Chapels and can only be cooled by ceiling fans and your own fan as Meg is demonstrating. 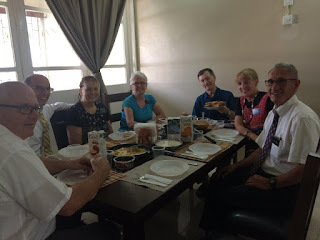 Every Friday evening the Senior Missionaries have the opportunity to attend the temple and afterwards go out to a restaurant together - once again we went to "The Lord of the Wings". This place recently raised their prices 30% so we may not be going there too often. On April 23, the Tema and Christianborg Stakes held a combined conference in the International Convention centre and created a new stake - called the Teshie Stake. The Ghanaians love soccer and we took a picture of these boys playing with a very well used ball. We wished we had a new one to give them - they can be bought from street hawkers for about $8. We gave each boy 1 cedi - $0.30 to take their picture. Meg is getting some jewelry from a store in Osu that is run by an 82 year old woman from Lebanon. Hanging on the walls I noticed this picture of her and her late husband with President Bill Clinton who visited their store many years ago. Today we attend the Ashaiman Stake conference and it was really good with an outstanding choir and great talks from a number of people including President and Sister |Heid and the Stake President. The Stake President had all children and young adults stand up to illustrate how young the Stake population is - out of 2400 people 1500 are children and single adults. Last of all, another picture of a ramshackle vehicle with is a taxi with extended hub caps. Fantastic update. You must be getting sick of chicken/pigion and rice.